English classes; where open-ended questions make eye contact with the teacher just about as avoidable as the bubonic plague. Some of you may be wondering, what exactly is the point of missionaries teaching English? 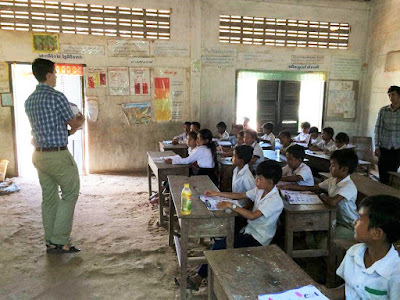 There are an immense number of answers, but let me try to put it simply: Learning English in Cambodia is like getting a good business degree in the US. It allows students to pursue further study in college, get good jobs, and support their families. Furthermore, most jobs in Cambodia require seven days of work weekly. On the contrary, jobs received after English or college training often only require five or six, allowing educated workers to invest their free time in serving their local communities and their churches. 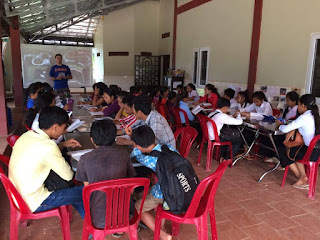 Recognizing these benefits, many students, both Christians and Buddhists (the state religion here), are drawn to come and learn English at the Smith’s house from week to week. By means of English education, many in Angk’jeay have become friends of the Smith’s, are prepared for better futures, and have been exposed to and put their faith in Jesus Christ. For those of you who haven’t had the chance to teach English as a second language yet, let me paint you a picture: Imagine playing UNO. Now forget that, because it’s is nothing like playing UNO. Teaching English is an attempt to reconcile the differences in pronunciation and cultural connotation that languages have adopted throughout centuries for the sake of attaining common linguistic understanding. Many phrases that are completely casual in one culture may be nonexistent in another. And even more frustratingly, there are sounds that are common to some languages that are completely foreign to others. For example, a couple days ago, I spent a decent amount of time working with students to pronounce the word “year” since the “ee” sound is essentially never used in Khmer. Oppositely, Khmer often uses the “sr” sound with a rolled “r,” which never occurs in English. On the bright side, students have gotten some good laughs out of me trying to pronounce their names. In spite of some difficulty, the classes have been so much fun to teach here. As the son of a math teacher, I’ve grew up getting to see many people experience this whole “learning” thing, and I’m a fan of it. 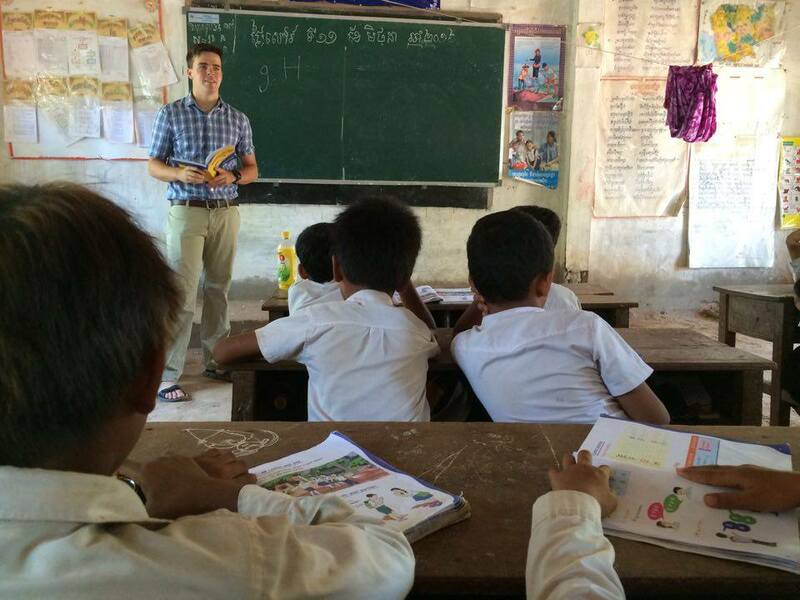 One of my favorite things about teaching, specifically in the public school, is that I’ve been able to try out some of the Khmer phrases I’ve learned. My use of those phrases is similar to Ron Weasley casting spells in The Sorcerer’s Stone. They almost never have the effect I anticipate (blank stares tend to be popular), but when they actually communicate what’s intended, it’s magic. To discuss an experience teaching in the public school, I would like to draw your attention to the picture on the left, which is simply a cropped version of the picture above. 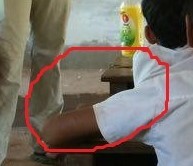 Circled in red is a ledge that leads up to the chalkboard. Though proposed to be helpful for student sight and reaching high places on the board, there is a simple downfall of this mechanism (or at least in my use of it). Tuesday morning, I was teaching the numbers from one through ten and had them written on the board. I was randomly pointing at different numbers and the students would respond with the name of the number. Much like The Count from Sesame Street, I think numbers are pretty hype, so I was getting into it. As I swung back from the right side of the board to point at the “1” on the left side, I misplaced my back foot, slipped off the platform and nearly bit the dust about five feet from the classroom door. After regaining my balance (and whatever was left of my dignity) I took a bow, as the students enjoyed a great deal of laughter at my expense. I’m thankful for that moment. Even while being the subject of their amusement, I got to experience the sweet way in which laughter can completely transcend language. Our hope is that my time teaching at the public school will create an even better relationship between the Smith’s ministry and the public school here. Perhaps some students will consider joining in the classes at the house. I will talk more about the language classes that go on at the Smith’s home in future posts, but this is all I had time for today. Thank you so much for your thoughts, prayers, and support. The people are kind, generous, and always up for a good laugh. 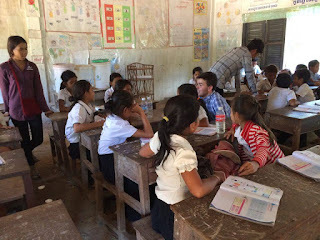 As soon as we arrived in the village, I had the chance to observe one of the main ministries being done through Luke and Sokha; English classes. By 11:00AM, students had begun to pour onto the grounds around the Smith’s home to hang out with each other and prepare for the noon English lessons. Three days a week, the Smith’s (along with the help of Samuth, the pastoral intern) use the recess hours of public school to host English classes for beginners, intermediate, and advanced speakers. For the next seven weeks, I will be assisting with the teaching of these classes. As Saturday morning came, we had the chance to talk with the public school principal in hopes that I would be able to do some english instruction there during my stay in the village. Fortunately, he seemed to like the idea… or Luke threatened him; frankly, I didn’t really understand the conversation since it was in Khmer. * Either way, on Tuesdays and Saturdays (yeah, they have school on Saturdays here… so quit complaining) I will be teaching 4th, 5th, and 6th grade english classes. After our conversation with the principal, it was almost time to start guitar classes. 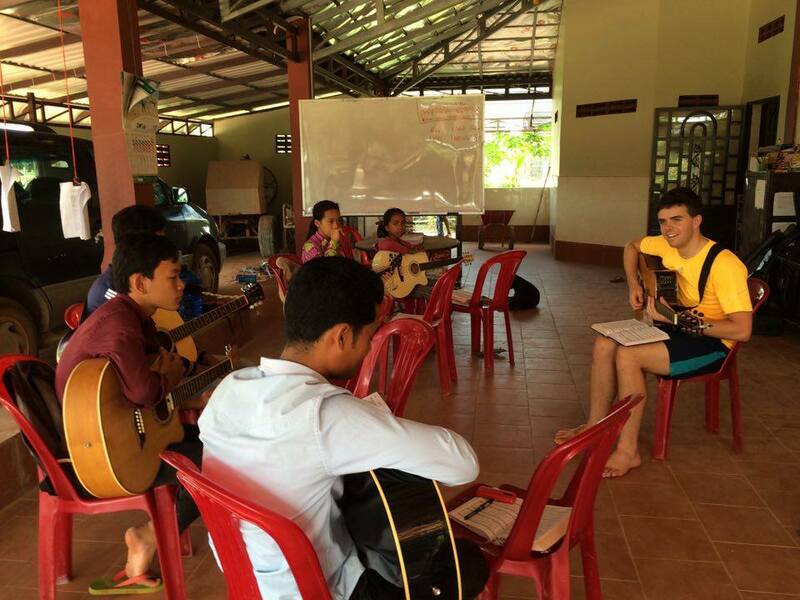 Another large part of the Smith’s ministry to the village is teaching guitar classes to members of the church. Since Sokha is still in recovery with baby Asa, I will be teaching all of these classes (with plenty of pro-tips from her). Similar to the english classes, they are tiered into three groups based on skill level, and we are hoping to make them bi-weekly for my time here. To my great pleasure, Saturday ended as most other days end here; playing sports. 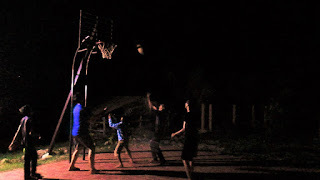 The students in the village love sports. They play soccer, basketball, and some others, but most of all, they enjoy volleyball. Not what you were expecting? To be perfectly honest, I was a bit surprised as well, especially when I was getting humiliated by students who are substantially smaller than me. You know what they say; it’s all fun and games until you’re getting spiked on by someone who’s six inches shorter than you. 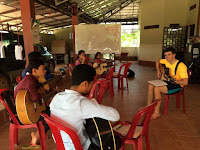 Sunday was a huge encouragement as students that I had met earlier (along with some adults) came to church to teach Sunday School, play music, and participate in worship. Many of them live in homes that do not believe in Jesus Christ, but nonetheless they are committed to the church and its work here in Cambodia. Already through all of these things, it has been such a privilege to interact with these young men and women. There is still much more to tell you about, but I’ll have to leave it there for now. 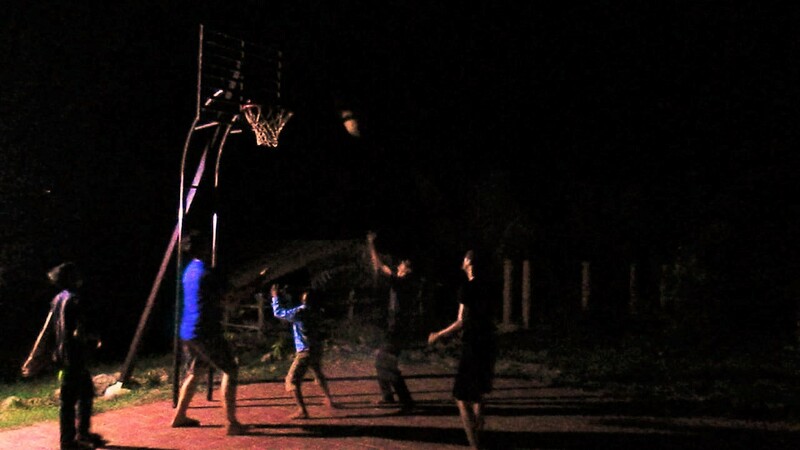 Please be praying for the gospel to be even more clearly seen and heard in Angk’jeay. *For the record, Luke just confirmed with me that he did not, in fact, threaten the principal of the local public school.